Starting Thursday afternoon in St. Paul, Minnesota, the most exciting four weeks of hockey makes its annual return when the conference tournament finales kick off across the country. 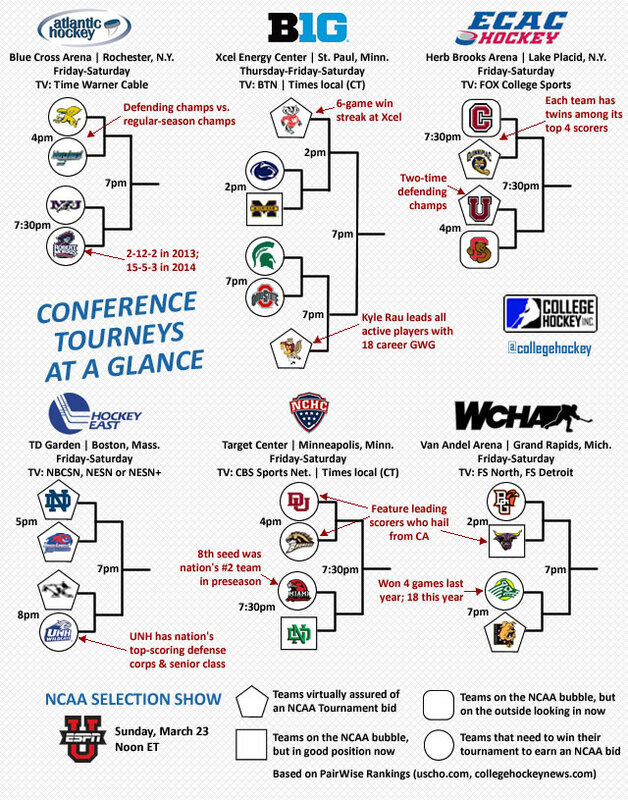 The only thing as unpredictable and entertaining as college hockey’s postseason may be its basketballing cousin often referred to as March Madness. There’s always that anything-can-happen feel to these next few weeks. There are almost always stunning upsets, the occasional surprise conference champ to throw the NCAA tournament into flux and some fantastic individual performances. The best part? Almost all of it will be nationally televised. As it gets to this stage of the season, the conference tournaments will also offer an interesting look as the first year of realignment in college hockey comes to a close. It wouldn’t be fair to make sweeping statements about the future at this point, but these next few days allow each conference to put their best foot forward and show whether or not they were ready for the big time. With that in mind, I decided to take a look at realignment as its first season wraps up, while also taking a look at the weekend ahead including top match-ups and 10 players to watch. It’s a bittersweet weekend ahead, particularly knowing that the WCHA Final Five, which created so many great moments and huge crowds over the years, is but a shadow of its former self. It will show in attendance when the WCHA takes its tournament to Grand Rapids, Mich., leaving the Xcel Energy Center for the first time since 2000 now that its major attractions are no longer in the league. College hockey will never be the same. Whether it’s for the best or not, we won’t know for a little while yet. I anticipated I would feel different about this college hockey season, but I was more than willing to be open to realignment and even was excited about it. I have to admit, I came away from this college season underwhelmed and anxious about the future. Change is hard. That’s why I want to give this a few more years before making a decision on whether or not the new conference structure will be a success, though I anticipate there will be more realigning over the next five years, if not sooner. I don’t think it will be because college hockey is expanding either. Hope I’m wrong. Some of the key issues going forward include the structure of the Big Ten, the loss of traditional conference rivals, mid-major schools losing big-conference status. All of these were expected to be the hard casualties of realignment. The question is just how negative it will impact things. A big positive, however, was the television exposure this year. With games on NBC Sports Network, CBS Sports Network, Big Ten Network, ESPNews and ESPNU, on top of games picked up on outlets like Fox College Sports, every weekend there was something for college hockey fans across the nation. That’s a big positive. One problem with the TV this year was that a lot of the match-ups that made it to a national audience weren’t terribly compelling. It’s hard to plan out, because you don’t know how teams will play in a given year, but there wasn’t a lot of memorable moments on national TV this year, which I think impacts the way I viewed the first season of realignment. This isn’t realignments fault, at least not mostly. I thought this was a bit of a down year for college hockey in general. Losing some of the pomp and circumstance of the conferences of old definitely played a role, though. It’s going to be an adjustment. The Big Ten’s conference structure with only six teams is going to get old fast, if it hasn’t already. This was a known issue coming into the season by anyone that has a working knowledge of college sports. The conference season is a bit monotonous with four games against each of the other five schools, but the fact it allows for a robust non-conference schedule is good. It’s just that it’s like two seasons. The competitiveness of the conference is also an issue as it’s currently divided rather clearly into three haves and three have nots. That doesn’t make for an exciting regular season. That hopefully changes within in a few years, but I think it will take at least a few before it gets better. The most exciting conference in terms of quality of hockey and competitiveness was the one that changed the least. Hockey East merely added Notre Dame and will soon have UConn as well, but I thought that was a compelling schedule. The league also had the benefit of Johnny Gaudreau doing otherwordly things and two of the best young goaltenders in the country. There’s a lot of intrigue about Hockey East, and before you go shouting East Coast bias, I live down the street from a cornfield in the Midwest, OK? The NCHC was pretty compelling as well, with their regular-season championship going down to the wire. It would have been nice to see more of their games on TV, but it was nice that the conference streamed all games live and free for their first-round playoff series. There was great parity in the league as well. I think this thing has potential to work well down the road, but it’s going to take a few years to build up some of these new rivalries and build storylines year in and year out. It wasn’t going to be the old WCHA overnight. There was plenty of excitement over in the ECAC, left untouched by realignment, with their top-end teams looking awfully good, particularly Union, which has a rather exciting lineup. Quinnipiac remains an intriguing program going forward as well. The WCHA was Ferris State, Minnesota State and everyone else, but I think there’s opportunity for this conference to become more competitive in the future. The big question is how will the loss of big-name opponents for these teams from the old WCHA and CCHA impact their home ticket sales and recruiting. That could mean parity, but it also means the top teams regress in the talent they’re able to bring in. A lot left to be seen there. Atlantic Hockey will lose UConn, but beyond that, it remains the quietly competitive conference that seems to get by on parity and proximity rather well. What will be interesting going forward for all of these teams is how the difference in travel costs from the old conference format to this one will change how schools feel about their current structure and if the loss of old rivalries negatively impacts attendance overall. It’s going to take a few years for those to make an impact, but both could be major factors in the future of this structure. In about four years, we’ll know if it was all worth it. If it is, there is little change. If not, we’re back to teams moving around and that won’t be much fun. This shows you where to find these tournaments on TV. Depending on your cable or dish package, you could conceivably see every single game, if you’re a supreme multi-tasker. These are the opening-round games I will be following with the most interest. Notre Dame is a team I just can’t seem to put a finger on. Sometimes they look like a championship-caliber club, other times far from it. However, coming off the big upset over Boston College in the first round of the Hockey East tournament, which including a seven-goal outburst in Game 1, the Irish are playing their best hockey of the season. Lowell meanwhile had to scratch and claw for a series win over scrappy Vermont. Connor Hellebuyck and Doug Carr are a remarkable goaltending tandem, which offsets a team the fact that Lowell has been a light-scoring team lately. This match-up has the potential to be the best game on Friday. The RedHawks had a rather stunning season. Considered a national title contender in the preseason, 17 of Miami’s 19 losses came in conference. They were the last-place team in the NCHC, but ended up knocking off regular-season champ St. Cloud State in the first round of the conference tournament. The only way they get into the national tournament is by winning the NCHC and they have to go through a very tough North Dakota club to do it. UND struggled with Colorado College in their first-round series, needing three games to outlast the Tigers, but on paper, they’re the best team left in the NCHC tournament. In fact, they’re the only higher-seeded team to advance to the Target Center. These two clubs played a really fantastic series early in the season, which they split. North Dakota then swept Miami on home ice later in the year. The RedHawks have their backs against the wall, while North Dakota is not yet assured a national tournament spot (though probably pretty close to it). Desperate hockey is fun. That’s what we should see here. Union has a veteran-laden lineup with some big-time postseason experience, but Cornell is always a tough out in the postseason. They also have a senior goaltender who has the potential to steal games for them. Union has a dynamic, high-scoring group led by Daniel Carr. Senior defenseman Shayne Gostisbehere may be one of the best players in college hockey right now and goaltender Colin Stevens has upheld Union’s recent tradition of excellent goaltenders. I think this is going to be a tough matchup for both clubs, but a compelling one. Union is the two-time defending champion and they’ll make the NCAA tournament, but I just never count out Cornell in these situations. There’s no way around this one. I think every conference has to come into the tournament events at neutral buildings with some trepidation. USCHO.com had a great graphic of attendance over the years at these events. The WCHA Final Five, which was by far the best attended, is now fractured into three different conferences. That means everyone’s attendance is likely to suffer. The NCHC has to breathe easier knowing North Dakota made it to Target Center after a tough three-game series with CC, because without them, that place would have been dead. It might still not be great. UND fans will travel, but without a Minnesota-based school to grab some of those many extra seats available, it’s going to be a challenge. The Big Ten has the Xcel in St. Paul. With Minnesota drawing, they should do well for any Gopher game. The dream scenario for the conference is a Wisconsin-Minnesota title game, which would have high sell-out potential. I don’t think it will be able to match Final Five interest, but the Gophers are a powerful draw. Considering Michigan and Michigan State fans didn’t often travel to Joe Louis Arena for the CCHA finals, I don’t think you’ll see a lot of Maize and Blue or Green and White, but you never know. Even the Hockey East tournament could suffer with the lack of Boston College or Boston University at TD Garden this year. This could be a rough weekend for college hockey in attendance optics, especially with these crucial games being on national TV. We’ll see how it goes, but I think conference finals ticket sales will be another victim of realignment until people get used to this. Shayne Gostisbehere — D — Union — One of the most dynamic defensemen in college hockey this year and a strong pro prospect, this Flyers draft pick had a remarkable year for Union. He averaged nearly four shots on goal per game from the blue line and scored eight times this season. His skating and puck-moving skills are special. Adam Wilcox — G — Minnesota — If you think Wilcox is a product of playing on a good team, think again. The sophomore netminder was one of the nation’s best on his own merit. He is tied for second in the country with a .934 save percentage, while playing almost every game for Minnesota. The Tampa Bay pick is growing into an elite NCAA netminder and was named the first-ever Big Ten Player of the Year. Sam Brittain — G — Denver — The senior netminder has kept a Denver team in transition with their heads well above water thanks to his stellar play. The veteran has overcome a number of injuries in his career and put together a remarkable campaign with a .934 save percentage. Only two goalies saw more shots than Brittain this year. The Panthers prospect could steal the Pioneers a title in the NCHC if he’s on his game. Kevin Goumas — F — UNH — After returning to UNH for his senior campaign, Goumas put together a 50-point season. He could have signed as a free agent last year but had a career year for the Wildcats instead. He is the highest scoring player left in the conference tournaments and will have to be excellent if UNH is to get past Providence. He probably has an NHL deal waiting for him when his season is over. Matthew Zay — F — Mercyhurst — The junior forward averaged 1.24 points per game for the upstart Lakers, who claimed the Atlantic Hockey regular-season title. He could draw some UFA interest this offseason, but first will have to find a way to lead Mercyhurst to the tournament. After their great run in the regular-season, they only get in with a conference tournament win. Riley Barber — F — Miami — Perhaps one of the better pro prospects in all of college hockey this year, Barber maintained a high level of production despite Miami’s down season. He’s already four points better than his standout freshman campaign with 43 this year. The Capitals draft pick may have a decision to make whether to stick for another year at Miami or sign a pro deal when the year ends. Sam Anas — F — Quinnipiac — One of the country’s best freshman this year is the undrafted, undersized Anas, who has lit the ECAC on fire this year. He had 21 goals and 42 points this season as he helped the Bobcats offset some of their key roster losses from last year. Rocco Grimaldi — F — North Dakota — The red-shirt sophomore was North Dakota’s leading scorer this season and will have to be a key offensive player if UND is going to end the weekend with a trophy. He has 35 points this season and remains a dynamic, speedy player that is rather exciting to watch. Christian Folin — D — UMass-Lowell — Probably the most sought-after college free agent on the market after his season ends, Folin is an intriguing talent. At 6-3, 210, he has a pro frame, excellent mobility and great physical strength (he shot a puck through the net last week). He’s worth watching just to see what all the deserved fuss is about. Mark Zengerle — F — Wisconsin — One of the better playmakers in the country, Zengerle has helped lead the Badgers to a rather strong stretch to end the regular season. The senior has 14 points in his last seven games and is likely to find himself on a lot of NHL radars as a UFA. Thank you Chris for your work! Always enjoy reading your writing! I think the biggest positive for college hockey is the TV exposure. As many negative comments about the Big 10 as you mentioned the TV coverage has been excellent. If you have ESPN, NBCSN, BTN, CBSSN, etc. you could watch college hockey on a national broadcast. Its a major step for the sport and a major recruiting advantage now for battles with kids considering the CHL. OMG, if the Big Ten continues with the same broadcast crew I’ll be on psychotropic drugs to get through the season. It is the clear leader in one thing….terrible broadcasts…it’s laughable that is the crew they hired with all this new money etc. I just can’t stand it…i’ve taken to listening to radio again and only watching their broadcast in critical moments or replays.